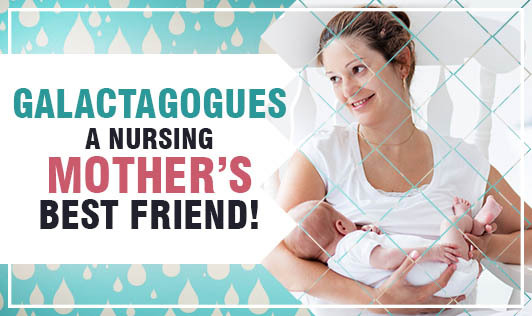 Galactagogues – A Nursing Mother's Best Friend! This is very true especially for a lactating mother. A well balanced diet for the mother is an absolute necessity to meet the nutritional requirements of lactation. A wide variety of foods should be included in the diet of the mother. Apart from that, there are special preparations for the lactating mother known as ‘galactagogues’ which are known to stimulate the production of milk. The word galactagogue originates from the Greek word galackto which means ‘milk’ and agogue which means ‘promoting the secretion’. Together, the word means ‘substance that promotes the secretion of milk’. The term galactagogue refers to plant-derived, synthetic or endogenous substance that is believed to initiate and enhance the secretion of breast milk. These include preparations made from carom seeds (ajwain), fenugreek seeds (methidana), ginger powder (saunf), sesame seed (til), poppy seed (khus – khus), and more. Foods like cumin seeds (jeera), aniseeds (saunf), caraway seeds (shahjeera), dill seeds as well as dill leaves serve as estrogenic and relaxing sedatives. They support digestion, relieve flatulence (may ease a baby's colic through the mother's milk), and aid in treating bronchitis and bronchial asthma (anti-spasmodic). Moreover, they also supply energy, protein, minerals like calcium, phosphorus, iron, and B-group vitamins. Galactagogues may be included in food preparations or may be consumed as a water–infused concoction. There are also many prescription and synthetic galactagogues available in the market. But why go for the artificial when you can go natural! Try to keep alternating between different types of galactagogues so that the body does not become desensitized to any one of it. Women may experience varying results with the intake of these galactagogues. A word of caution is to not substitute normal meals and fluids with these galactagogues. Always have it as a complimentary meal. For this, consult with your dietitian who can provide you with ways to include these items in your diet.